Period describes the time, in seconds, between wave crests. When period is short, waves run up the beach frequently and you’re constantly watching that you don’t get soaked. When period is long, you have more time to examine things on the beach between waves. Since swell is described by size and time I decided to check out the relationship between size and time for conditions when I’m on the beach. 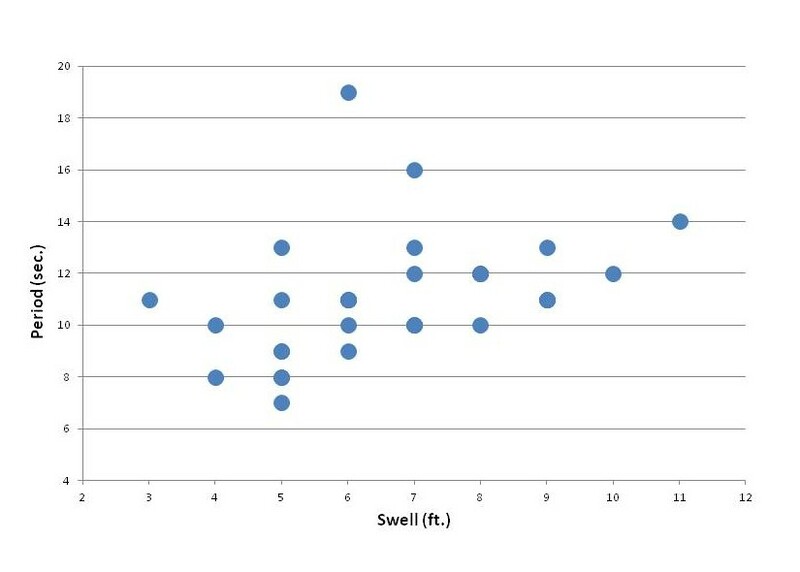 The graph above shows the relationship between swell size and period. It’s easy to see that swell size is a poor predictor of period. This graph is kind of neat to me because it lets me see that I most often enjoy the outer shores when swell is between 4′ and 9′ and period is between 10 and 13 seconds.